The Hellenic Community Centre, is undergoing a long sought after expansion, made possible with the assistance of a matching grant from the Ontario Trillium Foundationof $500,000. The total cost of the project is estimated to reach$1,350,000. The Community Centre will feature a Greek Library, Heritage and cultural space, administration offices and an enlarged lobby. The project is expected to finish by the end of May 2014. Phase 111 of the Iconography is now under way, it includes the dome of our church and downwards to the circular base including the four pillar corners. Make your donations today!! On Palm Sunday, several Community Groups presented donations to the President Mr. Giannoulis and Father Elias. The Daughters of Penelope presented their second $10,000 donation towards the Hellenic Community Centre addition. The Philoptochos Society of Holy Trinity also donated $10,000 towards the Hellenic Community Centre addition. 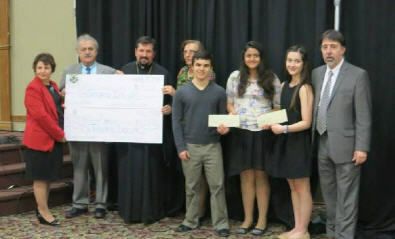 GOYA presented a cheque of $1,000 towards the Iconography Fund and $1,000 towards the purchase of liturgy books. The Orthodox Book Store presented $1,000 towards the purchase of liturgy books. The Dance groups recently also presented $1,000 towards the Iconography fund. thanks all the aforementioned organizations for their continued support. You make our Community so vibrant!